Health and safety (H&S) management is imperative for construction projects owing to the high level of fatalities and accident rates experienced. However, very few studies have used mixed-method research to examine H&S practices that are tailored towards small and medium constructio n enterprises (SMEs) to establish whether they influenced overall H&S performance. 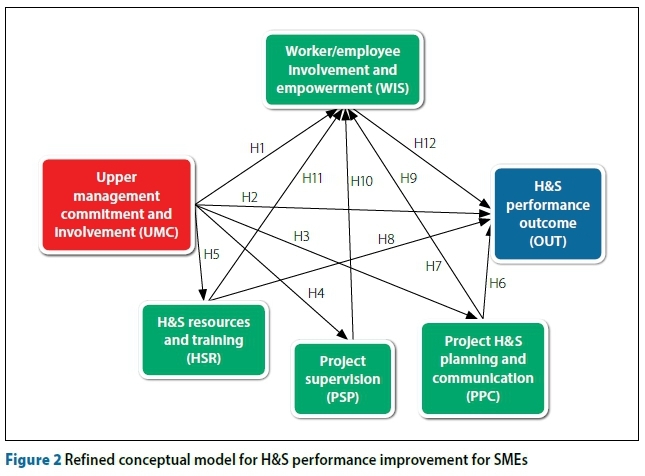 A Delphi study involving 16 H&S experts produced a refined H&S conceptual model comprising five H&S practices and one H&S performance outcome which were tested on 216 construction SMEs. Exploratory factor analysis and confirmatory factor analysis confirmed that the H&S practices and performance were valid, reliable and acceptable variables. Structural equation modelling (SEM) produced a good-fit model. Upper management commitment and involvement in H&S influenced overall H&S performance indirectly through the mediating variables of project supervision and H&S resources and training. These three H&S practices are essential in influencing H&S performance at project level of construction SMEs, and are viewed as catalysts for H&S culture. However, to ensure that H&S performance by construction SMEs is improved, upper management personnel should be committed and involved in H&S at project level. The H&S of workers is part and parcel of human security (International Labour Organization (ILO 2003)). The South African Occupational Health and Safety Act 181 of 1993 of states that every worker has a right to a healthy and safe working environment. Federated Employer Mutual Assurance (2017) reported that by June 2017, 24 fatal accidents had occurred in the South African construction industry, including construction SMEs. Although the average fatality rate had decreased in the UK, the Health and Safety Executive (HSE 2016) reported that in 2015 there were 43 fatalities in construction. In Hong Kong, construction recorded the highest number of work-related fatalities and accident rates (Labour Department 2016). In the US, 904 incidents were recorded in construction, which included construction transportation; fires and explosion; falls, trips and slips; workers exposed to harmful substances or environment and workers coming into contact with objects and equipment (Bureau of Labour Statistics (BLS 2016)). The construction industry is still plagued by poor H&S performance. However, these work-related fatalities, injuries and incidents are preventable. These statistics suggest that the construction industry is dangerous and hazardous, and this damages its reputation. These fatality, injury and incident rates have a negative cost effect on the economy as employees could be forced to take early retirement due to permanent disability, which makes them an economic burden due to their unemployability and pension payments. Furthermore, medical expenses incurred is likely to put a strain on the economy. The poor H&S performance in the construction industry in South Africa is exacerbated by limited commitment of SMEs to comply with basic construction requirements and their casual attitude towards H&S. SMEs do not properly maintain their tools and equipment, their personnel do not use their personal protective equipment, and they view H&S interventions as a luxury (cidb 2004). This is not unique to South Africa. Unnikrishnan et al (2014) found that in India safety management practices are inadequately implemented in the work environment of SMEs. According to the cidb (2009), SMEs lack formal occupational health and safety management systems (OHSMSs). According to Benjaoran and Bhokha (2010), most construction projects do not establish such a system on site. SMEs lack H&S training and competence (cidb 2009), and these shortcomings could jeopardise the improvement of H&S at the project level of construction SMEs. The poor H&S performance of the construction industry in South Africa provided the impetus for promulgating the Construction Regulations of 2003 (Smallwood & Haupt 2005) which were revised in 2014. For compliance with the regulations, Azimah et al (2009) argue that H&S management should be addressed. Unnikrishnan et al (2014) emphasise that H&S management practices should be improved to comply with H&S standards, which will result in better productivity. The underperformance by construction SMEs is caused by their financial constraints and their lack of managerial and technical skills (Department of Public Works (DPW), 1999; Agumba et al 2005; Martin 2010). This hinders the implementation of H&S practices, leading to poor H&S culture. It is imperative to identify H&S practices that are suitable, viable and manageable for construction SMEs. H&S performance measures are classified as lagging and leading indicators (Toellner 2001). Leading indicators can either be subjective or objective (Grabowski et al 2007). On the other hand, lagging indicators are measured by the number of accidents and workers' compensation statistics (Mohamed 2002). However, they can still be measured subjectively (Chinda & Mohamed 2008). The use of leading indicators instead of lagging indicators is increasingly advocated (Hinze 2005) to measure H&S performance. Flin et al (2000) state that H&S climate measurement is a leading indicator which measures the H&S culture of an organisation. However, for an optimum H&S culture to manifest, H&S practices should be implemented and practised effectively. Previous studies have not reached consensus regarding the H&S practices that could improve the H&S performance of construction SMEs and also evaluate their H&S culture (Mearns et al 2003; Teo & Ling 2006; Fernández-Muñiz et al 2007; Chinda & Mohamed 2008; Molenaar et al 2009; Cheng et al 2012). According to Grabowski et al (2010) and Hinze et al (2013), this is a leading H&S indicator. Which H&S practices are valid and reliable for managing H&S in construction SMEs? What is the influence of the H&S practices on the H&S performance on construction SME projects? 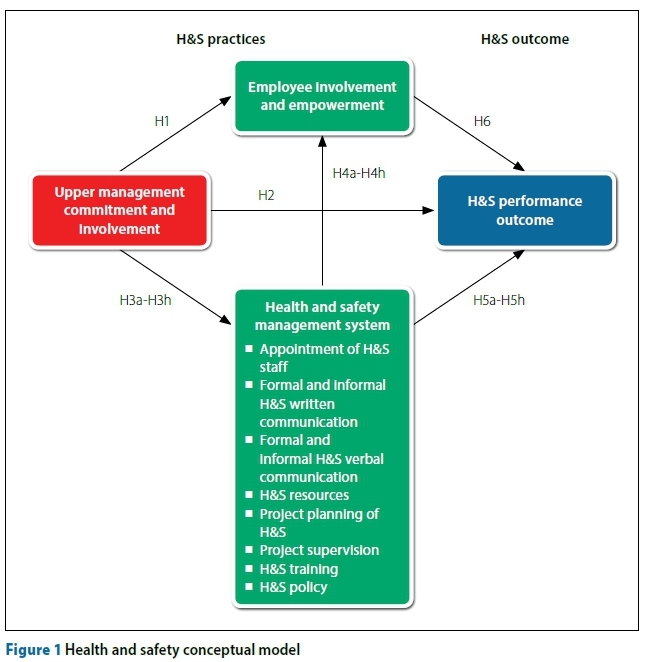 The conceptual model shown in Figure 1 suggests that H&S performance is directly determined by one independent factor, namely upper management commitment and involvement in H&S. This factor indirectly determines H&S performance via the intermediary factors of employee involvement and empowerment in H&S and an occupational health and safety management system (OHSMS) defined by eight practices. According to Vredenburgh (2002), the promotion of H&S culture can be influenced when workers are predisposed to display H&S-conscious attitudes in their work. H5a Appointment of H&S staff positively influences H&S performance outcome. Project supervision verifies the extent to which goals have been met, as well as compliance with internal norms or work procedures (Fernández-Muñiz et al 2007). Health and safety policy are the rules and procedures that employees' and management should adhere to in the workplace and are the bedrock of the OHSMS. According to Cox and Cheyne (2000), the major factor that influences H&S is the extent to which workers perceive the H&S rules and procedures as being implemented and promoted in the organisation. Ng et al (2005) and Fernández-Muñiz et al (2007) established the importance of H&S policy for improving H&S performance. Reece (2009) and Davies and Tomasin (1996) indicate that policy statements should indicate how upper management delegates H&S responsibilities. The H&S policy should state the commitment of management to providing H&S information, training and advice to employees. Employee involvement (or worker participation) and empowerment are important in improving H&S performance (Fernández-Muñiz, et al 2007; Arocena et al 2008; Aksorn & Hadisukumo 2008; Azimah et al 2009; Reece 2009). Empowered employees should be given authority and responsibility, and held accountable for making the required decisions in the organisation (Arocena et al 2008). The empowerment of workers is a necessary requirement building trust and cooperation, and it is essential for developing a vibrant H&S culture (Dingsdag et al 2008b). According to Reece (2009), employee involvement could prevent both personal and material damage. Health and safety performance defines the dependent variable which is influenced by the independent and intermediate variables. Fernández-Muñiz et al (2007) noted that subjective measures will overcome the limitations of objective responses, which are defined by the occurrence of accidents and near misses. The current study used subjective measures. The rating scale is a modified version of the earlier studies of Lu and Shang (2005), Fernández-Muñiz et al (2007) and Chinda and Mohamed (2008), who used subjective measures. A mixed-method research paradigm was adopted for this study, which entailed an exploratory design. The Delphi method was used to attain consensus on H&S measures that are ideal for improving H&S performance in construction SME projects. This method enabled the development of a refined questionnaire survey which was distributed to SMEs. The mixed method ensured rigour of the methodology. The Delphi questionnaire consisted of 64 H&S measures, categorised in ten H&S practices. Four rounds of Delphi survey were used to reach consensus on the H&S practices proposed for H&S performance improvement. Twenty H&S experts were purposively sampled, of whom 16 were involved in all the Delphi iterations. The experts rated the H&S measures according to their importance and effect on improving H&S performance at the project level of SMEs. The retained H&S measures had to attain a median value of between 9.00 and 10.00 for importance. Their impact value had to be between 90% and 100%. The two scales were used to ensure stringency in retaining a measure and to avoid bias by using only one measure to determine consensus. Thirty-one H&S measures were retained which were considered to improve H&S at the project level of SMEs. The retained H&S measures comprised the final questionnaire presented to construction SMEs in South Africa. The 31 H&S measures defined five H&S practices. H&S performance was defined by nine H&S measures. The SME respondents were required to indicate their level of agreement with the use of the H&S measures in their projects, rated on a five-point Likert scale, where 1 = strongly disagree, 2 = disagree, 3 = neutral, 4 = agree, and 5 = strongly agree. Other parts of the questionnaire were designed to profile the participants in terms of their position in the organisation, gender, race, experience in the construction industry and qualifications. The questionnaire also profiled the organisation according to the type of business and geographic location. The questionnaire was piloted with eight personnel members from eight construction SMEs who were knowledgeable about H&S measures practised at the project level. The final version of the questionnaire was presented to 1 450 conveniently sampled SMEs. The data was collected using e-mail, and a drop-and-collect method was adopted, which resulted in 228 questionnaires being returned. This represented a 15.7% response rate, which concurs with the findings of Kongtip et al (2008). Only 216 questionnaires were deemed valid for analysis. According to Kline (2005), over 200 usable questionnaires for statistical analysis using structural equation modelling are sufficient. Similarly, Pallant (2013) indicates that over 200 usable questionnaires are adequate to undertake robust statistical analysis. The software used was the Statistical Package for Social Science (SPSS) version 20 for the descriptive statistical analysis of the data. The frequencies, mean scores and standard deviation, and the factor analysability of the H&S practices and performance were computed. Similarly, exploratory factor analysis (EFA) was used to determine the unidimensionality and reliability of the H&S practices and performance. Reliability was tested using Cronbach's alpha with a cut-off value of 0.70 as recommended by Hair et al (2006). Maximum Likelihood with Promax Rotation was selected as the extraction and rotation methods in the EFA. Confirmatory factor analysis (CFA) was used to determine the acceptability of the H&S practices and performance. The Tucker Lewis Index (TLI), which should be greater than 0.90; the root mean square error of approximation (RMSEA) and standardised root mean squared residuals (SRMR) less than 0.08; p-value less than 0.05; and normed chi-squared (x2/ dƒ) less than 5 were applied. The structural equation model (SEM) using Aiplus version 6.1 was used to test the influence of the H&S practices on H&S performance. The data of the model was found to be acceptable after the fit indices of the model had been checked. The results indicated that 29.0% of the respondents were business owners, 67.0% had titles such as H&S representatives and site agents, and 86.0% were male. Africans comprised 61.0% of the respondents, 30.0% were white and 6.0% were Asianl Indian and coloureds. The majority of the respondents, 80.0%, indicated that they had over six years of experience in the construction industry. 28.2% of the respondents had a matric qualification, 12.0% had basic schooling with some having no qualifications, and the remaining 58.3% had post-secondary school qualifications. 37% of the SMEs were operating as subcontractors, 35.6% as general contractors, and 4.2% were civil contractors, suggesting that SMEs are involved in various kinds of construction activities. The majority (90.7%) of the respondents' conducted business in Gauteng Province. Table 1 indicates that 31 H&S measures were retained from the 64 H&S measures identified in the literature. The H&S measures that were not retained did not attain the recommended median value of 9.00, which was considered to be very important, and a 90% cut-off value was considered to have a major impact. These 31 H&S measures were then categorised into five H&S practices. These practices represented the refined conceptual H&S model after Round 4 of the Delphi survey. This is illustrated in Figure 2. Three of the original H&S practices conceptualised in Figure 1 were retained with the measures hypothesised to define them, namely upper management commitment and involvement in H&S with 11 measures, worker/employee involvement, and empowerment in H&S with five measures, and project supervision with six measures. However, two H&S practices were renamed. The first one was project H&S planning and communication with four measures. This combination concurred with the National Examination Board in Occupational Safety and Health (NEBOSH). The combination of these H&S measures to re-name the H&S practices was aimed at achieving the recommended number of measures, namely three, per construct. This was to enable robust statistical analysis to be done using SPSS (Pallant 2013) and SEM (Kline 2005). The second adopted name was H&S resource and training with five measures. This combined practice is in line with the findings of Choudhry et al (2007). The combination was acceptable because two measures were retained in the H&S resource practice, and three were retained in the H&S training practice. The refined H&S conceptual model was then tested statistically. Prior to the assessment of the structural model, exploratory factor analysis (EFA) and confirmatory factor analysis (CFA) were carried out. The EFA determined the validity and reliability of the five H&S practices and the H&S performance outcome. Two measurement properties were used, namely convergent validity and internal reliability. The results are tabulated in Table 2. The five independent variables of upper management commitment and involvement in H&S, employee involvement and empowerment in H&S, project H&S planning and communication, project supervision, and H&S resources and training were reliable. Their individual Cronbach's alpha coefficients were > 0.70, indicating acceptable internal reliability as recommended by Hair et al (2006). The Kaiser-Meyer-Olkin (KMO) of each variable was greater than the recommended value of 0.60 and the Bartlett's Test of Sphericity was p < 0.000. The results are in line with the suggested cut-off values according to Pallant (2013), which suggest that factor analysis could be conducted with the data. Factor analysis revealed that the measures of upper management commitment and involvement in H&S, employee involvement and empowerment in H&S, project H&S planning and communication, project supervision, and H&S resources and training loaded together on the respective variables. The factor loadings for all the measures were greater than the recommended value of 0.40 as suggested by Field (2005) and Hair et al (2006), therefore achieving convergent validity. The eigenvalue for each of the constructs suggested that they were unidimensional. It can be stated that sufficient evidence of validity and reliability was provided for these H&S practices which enabled CFA to be undertaken. The results are supported by the findings from previous studies by Findley et al (2004), Fernández-Muñiz et al (2007), Choudhry et al (2007) and Agumba and Haupt (2008). The dependent variable of H&S performance was reliable. The Cronbach's alpha was greater than 0.70 at 0.907, indicating acceptable internal reliability as suggested by Hair et al (2006). A KMO of 0.905 with Bartlett's Test of Sphericity of p < 0.000 was obtained. These were in line with the recommendation of Pallant (2013). These results suggested that factor analysis could be conducted with the data. All nine measures of H&S performance outcome converged together on this factor. The factor loadings were greater than 0.668 as shown in Table 2, which were greater than the recommended value of 0.40 as suggested by Field (2005) and Hair et al (2006). The eigenvalue of 5.267 explained 58.521% of the variance in the data. Therefore sufficient evidence of validity was achieved. The results indicate that the factor was unidimensional. The EFA statistics were valid and reliable, which enabled the measurement model to be analysed using CFA. 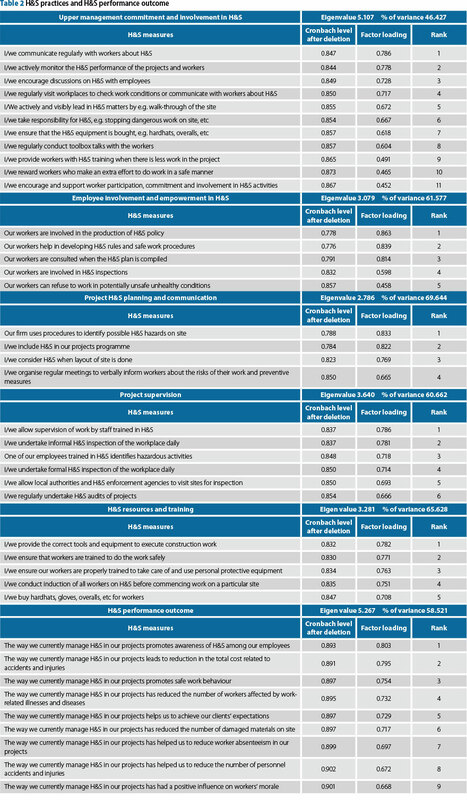 The results in Table 3 indicate that four of the five H&S practices tested did not fit in some of the statistical indices proposed, which led to re-specification. The re-specified H&S practices were management commitment and involvement, project supervision, project H&S planning and communication, and H&S resources and training. Four of the H&S practices' p-values were not acceptable. This was due to the large amount of data analysed which tends to produce significant results. Pallant (2013) argues that the p-value cannot be used as a solitary measure to determine the acceptable fit of a construct. The p-values of H&S performance and employee involvement and empowerment were acceptable. The fit indices for management commitment and involvement, employee involvement and empowerment, project supervision, project planning and communication fitted after re-specification, apart from the p-values. The p-values were significant. However, the other indices fitted, indicating that the H&S practices had a good fit. To support this finding the normed chi-square was less than the recommend value of 5. The CFI and TLI were greater than the recommended value of 0.90. The RMSEA and SRMR were less than the recommended value of 0.088. This result is in agreement with the findings of Fernández-Muñiz et al (2007). The fit indices for H&S resources and training fitted after the re-specification of the practice, apart from the TLI. The p-value indicated a non-significant result of less than 0.05. The normed chi-square was less than 5, indicating good fitting practice. The CFI was greater than 0.90, whereas the TLI was less than 0.088, indicating weak fit practice. The RMSEA indicated a close fit with a value of 0.088, and the SRMR indicated a good fit with a value of less than 0.08. The fit indices for H&S performance outcome fitted after the re-specification of the practice. The p-value indicated a non-significant result of less than 0.05. The normed chi-square was less than 5, indicating good fitting practice. The CFI and TLI were greater than 0.90, and the TLI indicated good fitting practice. The RMSEA and SRMR indicated a good fit with a value of less than 0.08. The results of the measurement models suggest that the refined conceptual model of H&S can be used to determine a perfect fit model of H&S for construction SMEs. Before the hypotheses were tested, the goodness-of-fit indices were examined to establish whether the data fitted the hypothesised model perfectly. The results in Table 4 indicate the goodness-of-fit indices for the structural model in Figure 3. The chi-square was significant with a p-value of less than 0.05, indicating that the null hypothesis of the model not fitting could be rejected. The normed chi-square ratio x2/df was 1.77, which was below the recommended value of 3.00. The RMSEA was 0.06, which was below 0.08, and the SRMR was 0.074, which was less than the recommended value of 0.08. The CFI was 0.849 and the TLI was 0.837. These values were less than the acceptable cut-off value of 0.90. Although the data did not fit the model perfectly, it could be described as having achieved a close fit. This enabled the results of the relationships of the constructs to be interpreted. Figure 3 shows that six relationships could not be rejected and six were rejected. The finding indicates that upper management commitment and involvement in H&S influenced project H&S planning and communication, project supervision, and H&S resources and training. A notable finding was that upper management commitment and involvement in H&S did not directly influence employee involvement and empowerment and H&S performance as per the hypothesised model. This was contrary to the findings of Fernández-Muñiz et al (2007) and Azimah et al (2009) respectively. However, it can be argued that upper management commitment and involvement in H&S influenced employee involvement and empowerment indirectly through the mediating variable of project supervision. However, employee involvement and empowerment in H&S did not influence H&S performance as hypothesised. Upper management commitment and involvement in H&S influenced H&S performance indirectly through the mediating variables of project supervision and H&S training and resources. Arguably, if upper management personnel are committed and involved in H&S, H&S performance will improve. This finding suggests that upper management involvement and commitment are critical for H&S performance success. The findings further established that employee involvement and empowerment in H&S were only influenced by project supervision. However, it was not influenced by upper management commitment and involvement in H&S, project H&S planning and communication, and H&S resources and training as originally hypothesised. Furthermore, project H&S planning and communication did not influence H&S performance as hypothesised. These results are contrary to the findings of Fernández-Muñiz et al (2007). However, it can be argued that Fernández-Muñiz et al (2007) tested the H&S practices as part of the OHSMS. They suggest that the OHSMS is influenced by management commitment, which in turn influences employee involvement and H&S performance outcomes. However, testing the hypothesised H&S practices in the OHSMS individually in this study gave a better thrust to the H&S practices that are directly influenced by upper management involvement and commitment in H&S and eventually impact H&S performance. The present study elicited information from H&S stakeholders in the construction industry regarding current H&S practices in SMEs and contributed to the existing literature by providing empirical evidence addressing the research questions. Results from the exploratory factor analysis indicated that the five H&S practices, namely upper management commitment and involvement in H&S, employee involvement and empowerment in H&S, project supervision, project H&S planning, communication in H&S and H&S resources and training, and the H&S performance outcomes were valid and reliable measures of H&S in SMEs. Attaining the desired levels of validity and reliability enabled the confirmatory factor analysis to be undertaken. The results indicated that the five H&S practices and H&S performance achieved an acceptable fit model to enable the structural model to be analysed. 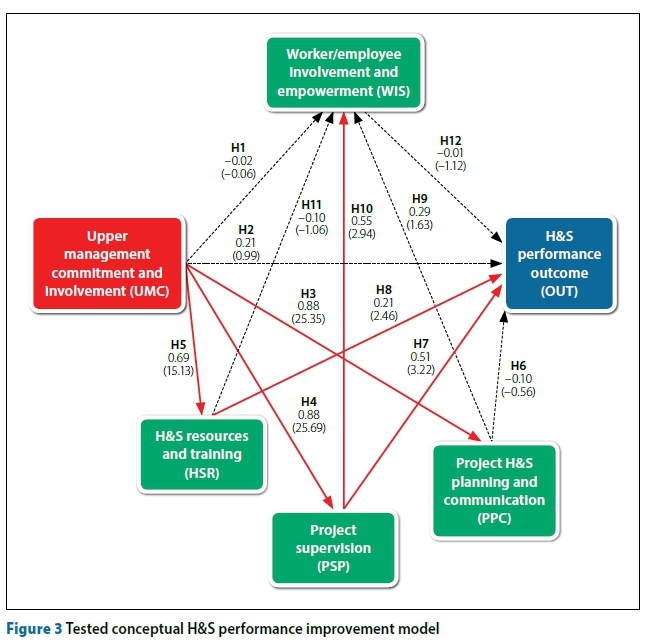 The results of the structural equation modelling indicated that upper management commitment and involvement in H&S influenced H&S performance indirectly through the mediating variables of project supervision and H&S training and resources. Each relationship was positive and significant. The findings inform SME contractors involved in building and civil engineering that upper management personnel should be committed and involved in H&S as they are the catalyst to ensure improvement in H&S performance. They will ensure that project supervision is undertaken to eliminate any hazards involved in the project. Furthermore, they will ensure that H&S resources and training are provided to their employees. In addition, the significant relationships in the tested model which influenced the H&S performance outcome can be deemed to be the minimum H&S practices that construction SMEs in civil and building projects should adopt. This will ensure that they have a small set of H&S practices to implement to improve their H&S performance outcomes, thereby ensuring that H&S culture is improved. This finding is important, especially in a country where H&S is not given the necessary attention. It is therefore suggested that upper management commitment and involvement in H&S, project supervision and H&S resources and training should constitute the construction H&S performance improvement model (CHSPIM). Finally, the findings of this study have contributed to the H&S body of knowledge in the South African construction industry. The managerial and practical implications of this study that should assist civil and building contractor SMEs to improve their H&S performance are three non-negotiable H&S practices. These H&S practices are upper management commitment and involvement in H&S, project supervision, and H&S resources and training. In addition, the proposed H&S model will enable H&S culture to be developed at project level for construction SMEs. Furthermore, it can be argued that South African construction SMEs require only a few manageable H&S practices that would assist them in managing their H&S activities effectively. This is because construction SMEs do not have the resources that large construction firms have to enable them to implement a large number of H&S practices. Furthermore, these H&S practices would act as early warning signs that an accident will occur if they are not implemented at all or not implemented properly. In addition, construction SMEs may find the developed questionnaire useful for auditing their H&S performance and benchmarking their H&S practices against those of their competitors. The practices can eventually be used to identify H&S areas that are problematic in the workplace and that require special and immediate attention. Finally, the H&S practices can be used to improve the minimal compliance with the requirements of the 2014 Construction Regulations so as to reduce site closures by the Department of Labour in South Africa due to non-compliance. The majority of the respondents conducted their business in Gauteng Province, which prevents the findings from being generalised to all the provinces of South Africa. The use of the self-reporting in the questionnaire for the independent, intervening and dependent variable is vulnerable to bias reporting, which is acknowledged in this study. It is recommended that further research be done. An employee survey is advocated, as the current study focused on upper management personnel and those knowledgeable about the current H&S practices in their organisation. It is proposed that these practices be validated using structural equation modelling to determine their relationship to and influence on H&S performance, i.e. reduction in accidents, injuries and damage to property, and to improve the motivation of the work force. Finally, the use of field observations is also recommended for future study to overcome the bias that a self-reporting questionnaire is perceived to have. The research funding support of the National Research Foundation (NRF) is gratefully acknowledged, without which this project would not have been possible. DR JUSTUS N AGUMBA (Pr CM, MCIOB) is a registered professional construction manager and chartered member of the Institute of Building. He holds a PhD in Engineering Management, a Master's degree in Construction Management and a Bachelor's degree in quantity surveying. He has worked as a site agent, an estimator, a draughtsman and a lecturer in both Kenya and South Africa. He is currently senior lecturer and researcher at the Durban University of Technology. He has published articles in peer-reviewed academic journals and presented papers at local and international conferences where he received Best Paper awards. PROF THEO C HAUPT (Pr CM, ACHASM) is the current holder of the SARCHI Chair: Sustainable Work, Environment, Education and Transformation, the eThekwini Chair: Sustainable Built Environment and a Newton Advanced Fellowship. He is an NRF-rated Research Professor: Engineering at Mangosuthu University of Technology. His PhD thesis dealt with alternative approaches to the management of occupational health and safety on construction sites. His recent focus has been on the cost implications of the present OH&S legislative and regulatory framework in South Africa and he has served on the Advisory Council for Occupational Health and Safety of the Minister of Labour. His other research interests include the areas of construction industry development and education.